Do Cats Mind Being Kept Indoors? Does keeping your cat in your house or apartment mean that he is cooped up or he is being kept from harm? You may hear some people say that keeping a cat indoors all day is cruel but indoor cats are much better off. If you ask your veterinarian, you would probably be told that your cat will be healthier and have a longer life. That’s because an indoor cat is less likely to be exposed to bacterial or viral infections. Last year while bike riding, I came across a dead kitten in the middle of the road. I thought that if that little kitten had a good home and was kept indoors, this wouldn’t have happened. 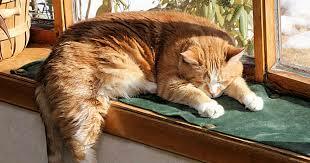 Keeping a cat indoors prevents it from being hit by a car or being attacked by wild animals. Chances are, an indoor cat won’t pick up any fleas or ticks. The biggest problem for an indoor cat is boredom. So the solution would be to provide your cat with plenty of cat toys and posts to scratch on and make sure that you play with him often. Give your cat things to look forward to and she will live a very healthy, happy, longer life. Turn on your oldies today! EDGEWATER GOLD RADIO playing the best oldies of your life! The 50s through the 80s all the time! Join us for a 60s and 70s weekend. Ask Alexa to “Play Edgewater Gold Radio! Listen on our website: Edgewater Gold Radio.com. This entry was posted on Saturday, March 16th, 2019 at 9:31 am	and is filed under Pet Supplies. You can follow any responses to this entry through the RSS 2.0 feed. Both comments and pings are currently closed.